A bear caught on camera at a New Hampshire shopping plaza was all the buzz around Keene on Tuesday. A bear caught on camera at a New Hampshire shopping plaza was all the buzz around Keene this week. Tuesday was a typical day at John Boudreau’s Vacuum Store - until he was greeted by an unlikely customer. “I’ve never seen a bear in the shopping plaza before,” Boudreau laughed. His encounter with the bear was captured on video by Sofia Thornblad, who was on her lunch break. “I think he must’ve been pretty confused about where he was and what was happening,” Thornblad said of the bear. 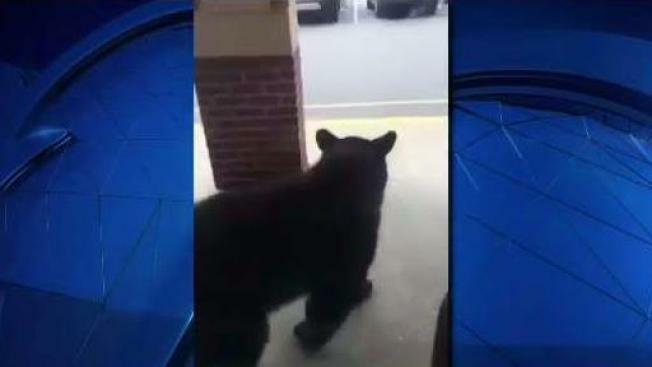 When the bear showed up at the West Street Shopping Plaza on Tuesday afternoon, it seemed almost everyone had their cell phones ready. At the other end of the plaza, the travel agents at AAA shot another video as the bear rattled the doors at Mattress Firm. “He’s like, ‘Let me in, I want to try each bed out,’” joked Pam Thayer, another agent. Keene police arrived within minutes, blasting their horn to scare the animal away from the shopping center. “The bear had the sad look on his face like, ‘Please let me in - the mean police officer is outside,’” Boudreau said. Eventually, the bear trotted down the sidewalk, around a corner, and disappeared into the woods. “Without anyone having to do any harm to him was really great,” Thayer said. “As cute as it is, as funny as it is, it’s not the best situation,” Thornblad added. Police said a bear sighting in the busy part of Keene isn’t that unusual. They said the bear’s natural habitat is directly behind the plaza, over the fence in the woods.